Running total of 3 consecutive years of Stashdown efforts. So. Things have been a bit bananas here lately, and I haven’t been able to make Q2’s Stashdown post until just now. While I’m not the most proud of quarter 2, I do have to admit that meager wins and being green in both categories pleases me. 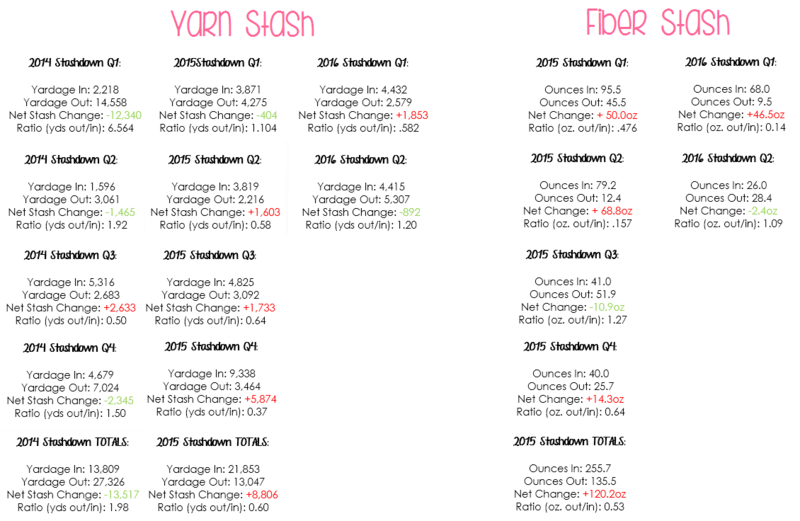 I managed to knit a bit more yardage out than I brought in (thank you, manic sweater knitting in May), and I did manage to just barely eek out a reduction in stash in the quarter as well. What I am most proud of in my efforts is the small amount of fiber that came in over the 3 month period of time: of that 26 oz, 12oz is my Hello Yarn club braids, which means I purchased 14 additional ounces of fiber. This is roughly 3.5 braids’ worth, or a single braid of fiber per month. Conversely, 2.4oz is just over half a standard braid of top, but a reduction is a reduction. So while this is more stash *maintenance*, I am calling it a reduction and WIN! Knitting wise, 892yds is just over 2 skeins of sock yarn, which isn’t bad considering I did make some larger sock yarn purchases, as well as holding some Lamby yarn for myself. I did destash a little yarn over the quarter, but it wasn’t much at all. Compared to Q2 of 2015, I did considerably better in both categories; my purchasing has definitely slowed down, even if my production isn’t increasing enough to make significant reductions at this point. I feel like 2016 is the year that all of my observations about my own behavior, while paired with these tracking efforts, are going to pay off, and 2017 will finally be the year of more significant reductions in stash. Cumulatively, both categories are still in the red. I’m hoping that staying green in Q3 and Q4 may bring me back to a neutral position for the year. We shall see!